The Florence Robson Memorial Cat Centre designed to board unwanted cats and kittens is dedicated to Florence Robson who established the Hobart Cat Centre in 1974. A plaque also pays tribute to Joan Allport for her work in the establishment of the centre. Originally located in Strickland Avenue South Hobart , the centre moved to its current location in 2004. 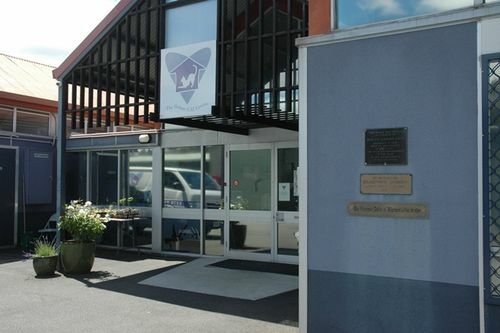 The Hobart Cat Centre was established in 1974 by Florence Robson, who had a vision to provide a shelter for all unwanted cats and kittens of Hobart. Miss Robson was a great advocate of responsible pet ownership and devised and implemented an education program for schools emphasising the importance and long term benefits of de-sexing and general cat care. Joan Allport was President of the Tasmanian Animal Protection Society from its inaguration in 1949 until 1979. The Florence Robson Memorial Cat Centre.